Vitamin C by Dr. Alexander Michalzik M.D. Vitamin C, buffered, by Dr. Michalzik is, in contrast to conventional ascorbic acid, a non-acidic form and thus gentle on the stomach. Vitamin C has universal functions in the body. In contrast to some animals, humans cannot produce vitamin C themselves. We are not always able to consume a sufficient amount of vitamin C-containing foods. Especially in times of stress, the need for vitamin C increases. The buffered form of vitamin C is the calcium salt of ascorbic acid. Buffered vitamin C is not acidic and therefore suitable for a sensitive stomach. 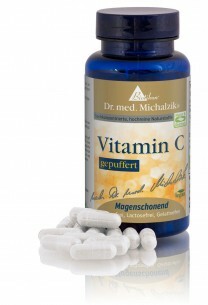 Vitamin C, buffered by Dr. Michalzik is subject to strict examinations of German supervisory authorities. It is manufactured by use of gentle production technologies without heat or additives and without the use of processing agents which are not required to be mentioned on the packaging. 1 capsule with liquid or as advised by your medical provider. 120 capsules with 320 mg of vitamin C per capsule.